February 6 – Rome Mayor Virginia Raggi has greenlighted the build of AS Roma’s proposed new 52,000 all-seat stadium – Stadio della Roma – in the south of the city. Construction could begin by the end of the year. Raggi had requested a final report on the stadium plans with particular emphasis on whether it would create transport issues. Giving the go-ahead, she said: “The prosecutors office had said there were no problems with the project, but I wanted to check that everything was all right and the approvals were not just formal. “This external report confirms this. Plans for the stadium were first unveiled 2014 and initially given the all-clear at the end of 2017 before hitting a number of snags, including the arrest of nine people linked to the venue’s construction. 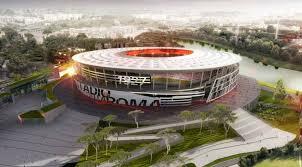 Roma’s new modern stadium will dramatically improve the club’s revenue generating potential and see it move out of city-owned Stadio Olimpico, which they share with Serie A rivals Lazio.